The issue of whether or not Wisconsin needs stronger recusal rules for judges who receive sizable campaign contributions or benefit from "outside" so-called independent special interest group spending has emerged as a major issue in the last weeks before the April 2nd state supreme court election. The result of this contest will determine the successor to retiring former State Supreme Court Justice Shirley Abrahamson, after 43 years on the state's highest bench. 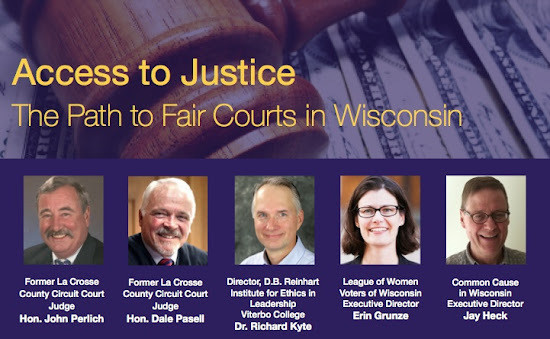 Wisconsin currently has the 4th weakest judicial recusal rules in the nation and that issue, as well as the importance of voter turnout in Spring non-partisan elections, will be explored at an upcoming town hall meeting, which is free and open to the public, on Monday evening, March 25th from 6:30 PM to 8:00 PM at the University of Wisconsin - La Crosse. All of the details for the event are here, on the printable flyer. 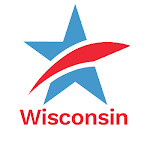 The recusal issue came to light recently when the Wisconsin Realtors Association withdrew their support for Judge Brian Hagedorn for the state supreme court election and demanded that their $18,000 contribution to him be returned. Another special interest group, Wisconsin Manufacturers & Commerce (WMC), announced they would not be supporting Hagedorn. Interestingly, Hagedorn has not expressed support for stronger recusal rules regarding campaign contributions and outside spending. The current rules were, ironically, written by WMC and the Realtors, and adopted verbatim by the 4 to 3 conservative majority on the Court in 2010. Currently, judges may decide for themselves whether or not to recuse themselves – a standard that has led to serious conflicts of interest on the state's highest court and the erosion of public trust and confidence in the judiciary at all levels in Wisconsin. Wisconsin Court of Appeals Chief Judge Lisa Neubauer is being supported by hundreds of thousands of dollars from an outside group headed by former U.S. Attorney General Eric Holder. Neubauer has requested the group not get involved in the election and has said she would recuse herself in any case that came before the Wisconsin Supreme Court in which Holder's group was a party. For more on all of this, go here. We are looking forward to seeing you in La Crosse next Monday evening! And please be sure to make your voice heard at your polling place, on or before April 2nd. La Crosse Town Hall Meeting March 25th: Recusal Rules & Voter Turnout in WI Supreme Court ElectionTweet this!